Arte by Antonio Citterio Surfside, Miami Beach condominium. NEW Surfside, Miami Beach Luxury Oceanfront condos for sale at Arte by Antonio Citterio. Arte by Antonio Citterio, will mark the architect’s first project in the United States. Arte is the most recent of 3 new oceanfront luxury condominium projects in Miami Beach's Surfside, which also includes the recently completed Fendi Chateau Residences and the Surf Club Four Seasons Residences and Hotel. As Surfside has a strict 12-story limit on all buildings, the recent boom in new luxury condominium developments in Surfside has produced what we would describe as smaller projects that focus on style and design, larger floorplans, resort-styled amenities and services among many other highly sought after qualities. 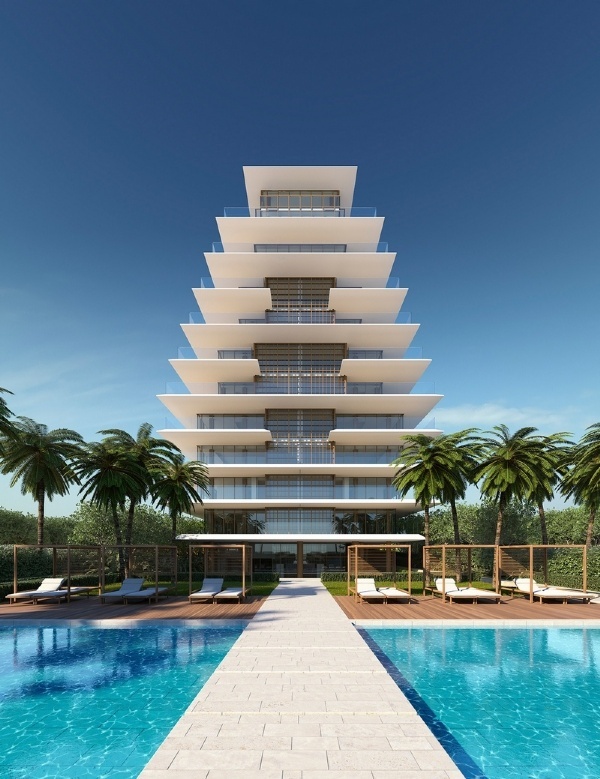 Arte by Antonio Citterio condominium will offer only 16 luxury condominium residences, beginning in size of approximately 5,500 square feet under air and larger. Expansive balconies will add to the large living spaces. Based on the building size and number of residences it appears that most floorplans will be full floor plans with a few half-floor plans also available. The Arte Surfside residences will be delivered furniture ready, with the interiors also designed by Citterio, and each unit will have access to an enclosed, air conditioned garage with spaces for three cars. Inside the "boutique-styled" Arte Surfside luxury condominium, amenities will include a spa, fitness center, and indoor and outdoor pools. And across the street, at 8926 Collins Avenue, a separate additional amenity building is planned, with another garage, 24-hour valet, a golf simulator, multi-use club room, cigar room and rooftop tennis courts. Acclaimed architect Kobi Karp is the architect of record, with landscape design at Arte by Antonio Citterio in Surfside will be Enzo Enea, who has designed the landscaping at many luxury properties throughout South Florida and across the globe.